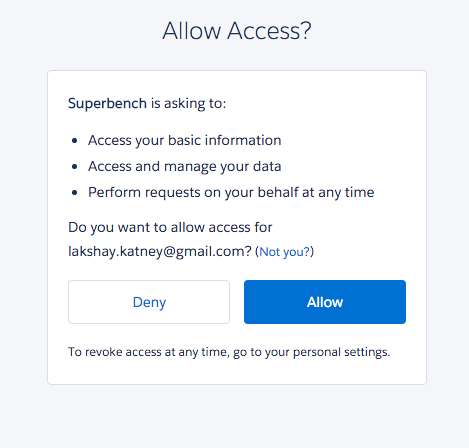 Superbench is a proprietary tool of lkatney.com, made for Salesforce to take away all pain of doing same things in mutiple orgs manually. Mutiple orgs can be added at the beginning, running same processes at the same time and getting results instantly on same page. It is kind of super-worbench that does everything for users without going to different applications or same application mutiple time for different orgs. By simply going to a single page, an action/process can be performed for every added org. It is free at the moment and need your valuable feedback for more features. MutiOrg - What does it means? Mutiple orgs can be added at a time & can do operations on them . Organizations are added on dashboard page. This is a one time activity and you don't need to add orgs credentails again & again. button on dashboard and then by selecting which organization(sandbox or production) needs to be added. Customer will be redirected to Salesgforce standard login page to initiate organization addition. This is a security layer for customers by initiating authentication at Salesforce end through OAuth using User Agent flow hence not storing/capturing usernames/passwords for customers. Application authentication works through User Agent OAuth flow given by Salesforce. At backend, we request Salesforce for refresh token once and use it forever, thus removing pain to use credentials again & again. It is totally safe as we only get token once user accepts/approves the request through UI. Once confirmed, application store this refresh token in database and use it for further operations. Once we get refresh token for Salesforce, We get some basic user & organization information. This information only includes username of user in organization & organization name. This is just to keep track which organization has been added to your account. Organization name is being used to identify which organization has been added to account. This is for scenarios where customer has same username in production as well as sandbox. In case of same organization names, system will handle the name by appending some random number at end hence distinguishing organizations. If any customer tries to add same organization accidently, System will throw an error with duplicate organization error. We don't store any passwords/infomation of customers from salesforce except username. Only active organizations take part in actions/processes. It is simple switch to active/inactive the organization. By this, application can run only for single organization as well. As discussed earlier in section How to add organisations, this button is to add organizations into account. Organisation can be removed in two ways either from Salesforce or through application. This can be simply done by clicking button on dashboard or by going into Salesforce to your user page, under connected apps. Standard & Custom objects Get all standard & custom objects from all organizations that are common. Metadata Components Get all metdata types from all organizations that are common. SOQL Run single SOQL queries against all organisations. SOSL Run single SOSL queries against all organisations. Insert Insert records against single object in all organisations. Can be single load or bulk load. Update Update records against single object in all organisations. Can be single load or bulk load. Delete Delete records against single object in all organisations. Can be single load or bulk load. Rest Explorer Basic explorer to make a rest call to all organizations at a time. Execute Anonymous Run execute anonymous against all organizations. In this section, you will get all standard & custom objects present in all orgs that are common in all. Common is important as single action should perform in all orgs so application does a smart check before displaying list of objects to customers. On other hand, their schema can be different in all orgs. Lets take an example: Account is present in all orgs so it will be available in list but it can be different in terms of fields/recordtypes from other orgs. Will display all common metadata component types. Again, schema can be different from other orgs. An example can be taken of ApexClass component. Number of classes doesn't matter here.